What does the Cura Software do? 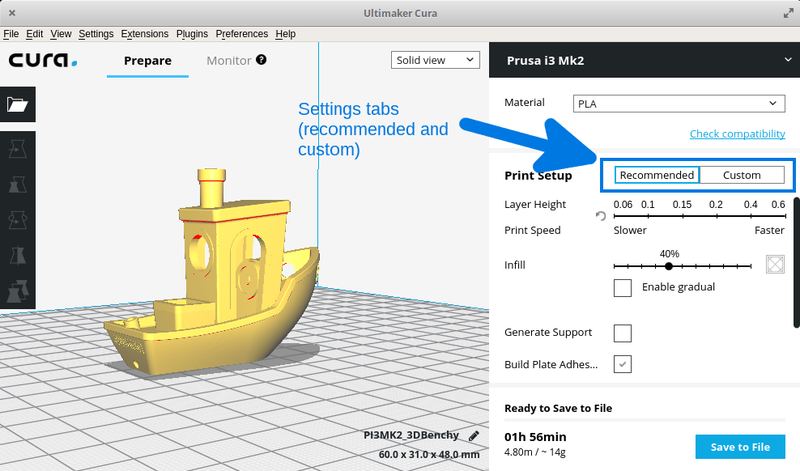 What are Cura's Custom Settings and why Should you Bother? Read our easy-to-understand 2019 Cura tutorial to explore the hidden features of the Cura 3D slicer software - that’s where the fun really starts! Cura 3D is the friendly face of slicing software, so much so that many users don’t even realize what it’s doing. Just load the model, select the quality and hit print. It’s as easy as traditional 2D printing. Essentially that’s all Cura is — print software — a way to get a digital file from your computer to the 3D printer in a format that the 3D printing hardware understands. Cura is not only free for you to download, it is also open source. It is the gold standard of 3D slicers worldwide. If you compare Cura to other 3D slicing software, it all seems very simple, with limited options and adjustments. 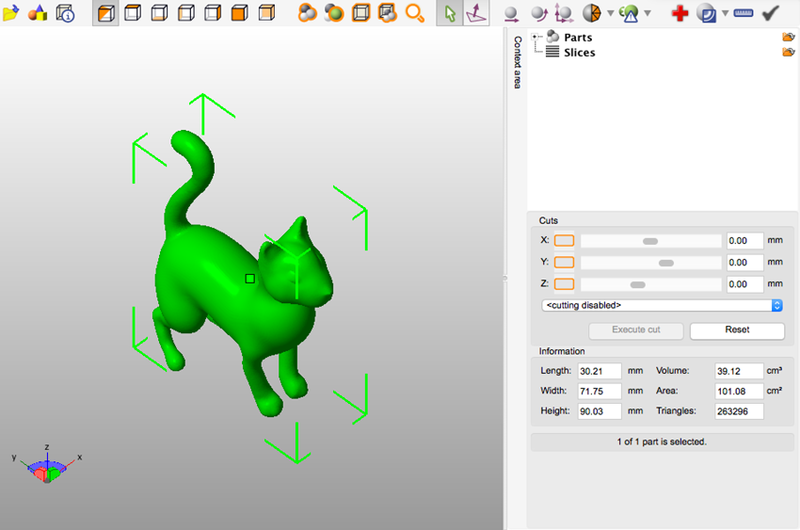 But Cura’s more complex settings are there if you need them; it’s just been designed very neatly and user-friendly. 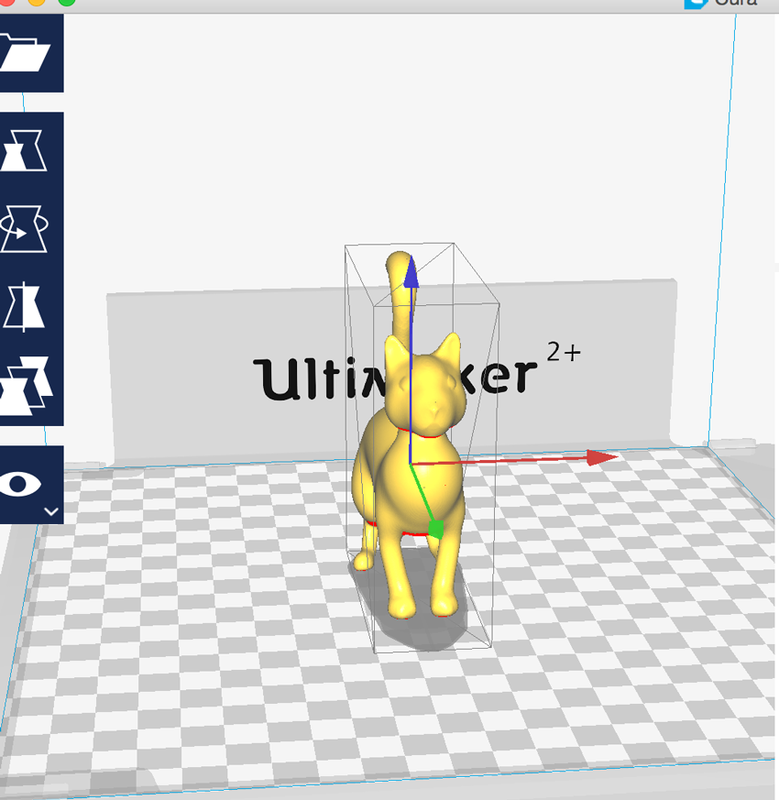 Cura is maintained by 3D printer manufacturer Ultimaker and – as we know from their hardware – they’re perfectionists. Hidden (but not too deeply) in the Cura software are almost all those settings and options that you can find in the majority of other slicing software. So if you are one of those people who like to tinker with the 3D printer settings, you can. For those that just want to print, change a few quality and speed options, then in Cura it’s all carefully laid out and ready to go. This Cura software tutorial is aimed at anyone just starting out with 3D printing. We’re only going to assume that you’ve switched on the printer and loaded the filament. From that point on we’re here to help guide you in the ways of Cura 3D and getting started with 3D printing. 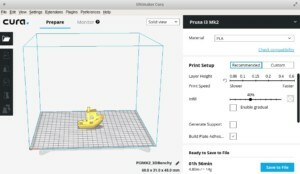 The showcased version in this article is Cura 3.6. However, the guide works just as well for older versions and we will keep you up to date, once the new version – Cura 4.0 – is released. Cura Tutorial What is Cura 3D? Before we look at Cura, there’s a little bit more to the whole print process when it comes to the 3D files and how they’re prepared. It is the process of a 3D computer file to a solid object that can cause confusion. So it’s good to have an understanding of the process even if you don’t need to follow the first step. There are three basic stages to preparing files for 3D printing. Modeling: This is carried out in any 3D modeling application such as Tinkercad or SketchUp, which are just two of many example applications. These applications have their own file format and these enable you to open, edit, save and export those 3D printer files from the application. 3D file export: Once you have created your model, it then needs to be exported as either an STL, OBJ or 3MF file. These are the file formats that are recognized by Cura. They differ from the file formats that are native to the 3D modeling applications as they just hold the final geometry and not the individual primitives and editable content. Still, you can change the size of the 3D model, but not the geometry. Slicing file export: The STL or OBJ file can then be imported into the Cura software where it is sliced and output as G-Code. This G-Code is just a text document (in essence) with a list of commands for the 3D printer to read and follow such as hot-end temperature, move to the left this much, right that much etc.. The first stage of the process requires 3D modeling, but if your modeling abilities are just in their early stages then you can pop along to sites such as Thingiverse or Youmagine and download millions of pre-made and print-ready models (more file repositories here). These are usually in the STL format and ready to be imported directly into the Cura software. Cura Tutorial What does the Cura Software do? Cura slices 3D models. It translates the 3D STL, OBJ or 3MF file into a format that the printer can understand. Fused filament fabrication (FFF) 3D printers print one layer upon another to build up the 3D object. Cura 3D takes the 3D model and works out how those layers are placed on the print bed and creates a set of instructions for the printer to follow — layer on layer. Cura generates instructions for your 3D printer. They are called G-Code, a text document that ends with the file extension .gcode. Open the file and you’ll actually be able to read through quite a bit of the code and understand what it’s telling the printer to do. As you become more adept at 3D printing you can go into this code and adjust fan speeds, layer heights and hot-end temperatures at different points. This can be handy when you need to troubleshoot some 3D print problems. We also have an in-depth article on G-code. As every printer has a different setup, print area, build plate and nozzle size, the Cura slicing software needs to know these hardware details in a printer profile. Once it has the required details, you can then specify settings like layer height and thickness. Based on the vital stats of the printer and your settings, Cura will calculate the path the printhead needs to take in order to print your model and produce a list of instructions for the printer. These instructions are saved in that G-Code file. The G-Code can then be saved to an SD card or sent to the printer over wireless or cable depending on the printer directly from Cura. There are many 3D slicing programs available on the market, Cura 3D is just one of many. But over the years, the continuous development and open source philosophy made this 3D slicer the gold standard. There are only a handful of 3D printers which aren’t supported by Cura – and if so, you can even add the printer yourself. You can download and run older versions if your computer does not fulfill the requirements for the newest version. 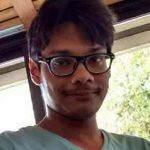 To install Cura, first download it for your OS from this page. When the Cura download is complete, here’s what you need to do on each platform. Run the Cura installer and go through the usual steps. The only non-trivial part of the installation is the following screen, which gives you the option to install additional components. 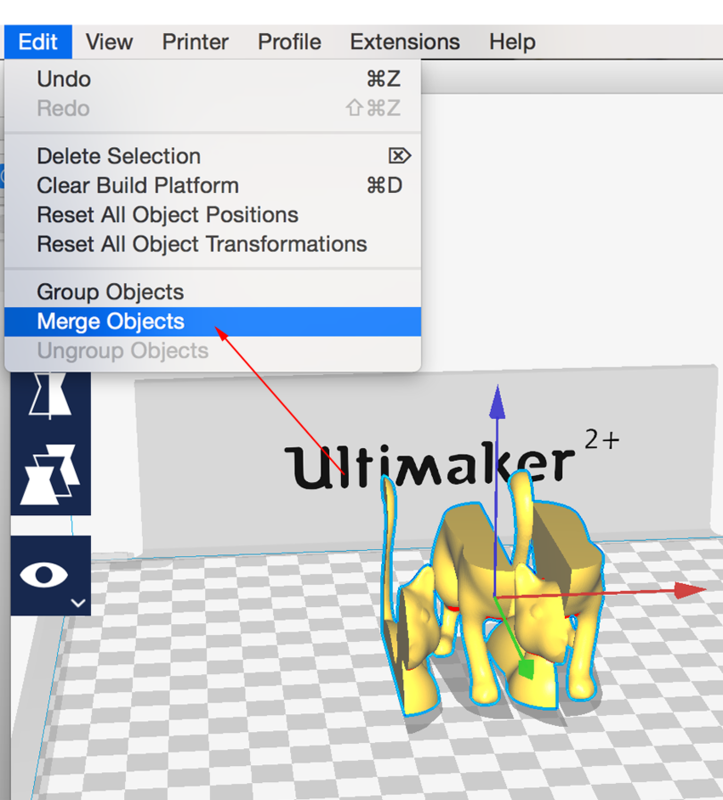 If you would like to import 3MF, OBJ or X3D models into Cura 3D, check those boxes and proceed. Once the installation completes, Cura should open automatically. Later on, you can open the Cura software from the Start Menu launcher. After downloading the Cura software installer, open the installer and run the installation wizard to complete the installation. Easy peasy. You can find Cura 3D in your programs folder. For Ubuntu, the downloaded file is called Cura-3.6.0.AppImage. This is a binary executable. 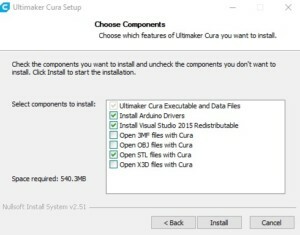 You should copy the Cura installer to a convenient location and give the current user the right to execute the file. To open Cura, simply execute the file from the terminal. On first loading Cura, you’ll be asked to select a printer. 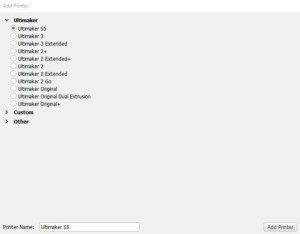 If you have an Ultimaker or Lulzbot, then there will be a tailored version of Cura software that shipped with your printer. If not, or if you want to set up a new printer, then select Settings > Printer. You’ll now be confronted with a selection of many printers. 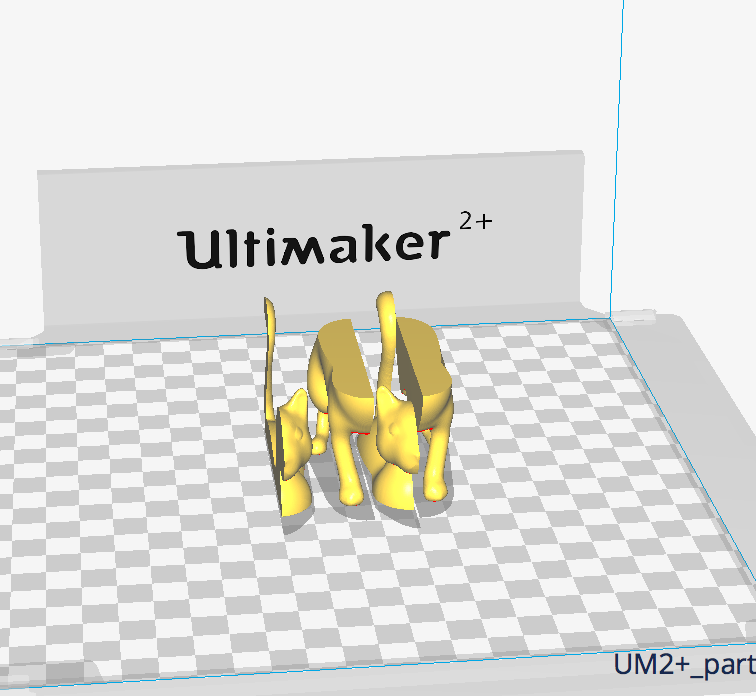 If you downloaded through the link at the top, then the listed printers will all be Ultimaker. For all other printers click Other and if you’re lucky then your printer will be listed. If not, then as with the Lulzbot printers, head along to the manufacturer’s website and you may find that there’s a custom version of the Cura software ready to download. If not, then select Custom and Add Printer. You’ll now be shown the Add Printer screen and here you’ll need to know a bit about your printer. Again, details should be found on the manufacturer’s website. If you built the printer yourself, then you should know these details off by heart! Just enter the settings for your 3D printer in the Cura settings and click Finish. Once you have setup Cura for your printer, it’s time to import a model into the Cura software. To import a model, you can either click on the floating folder icon on the left or select File > Open File(s) from the top menu. Select an STL, OBJ or 3MF file from your computer and Cura will import it. Wait a little bit and the model will appear on the Cura build area (the box in the center). When the model appears in the build area, it typically looks too small or too big. You might also want to see the model from another angle or from another height. Here is how you can change your viewpoint of the build area to get the most convenient view of the model in Cura. 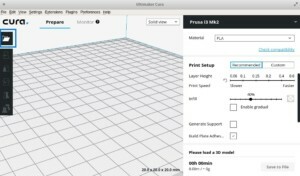 Navigate the Cura build area: Hold down Shift and left click to move the build area around the screen. This is often useful if you zoom into the model to check out some of the finer detail, only to find that the detail you want to look at is hidden off screen due to the scale. Rotate around the Cura build area: Press and hold right click to rotate around the build area (In Ubuntu and Mac, you can simply press the left mouse button and drag in order to rotate the model). This is handy for checking the 3D model from every angle. Zoom the build area in the Cura slicer: Use the mouse’s middle scroll wheel if you have one to zoom in and out of the model. If you don’t have a mouse with a scroll wheel we would highly recommend getting one. 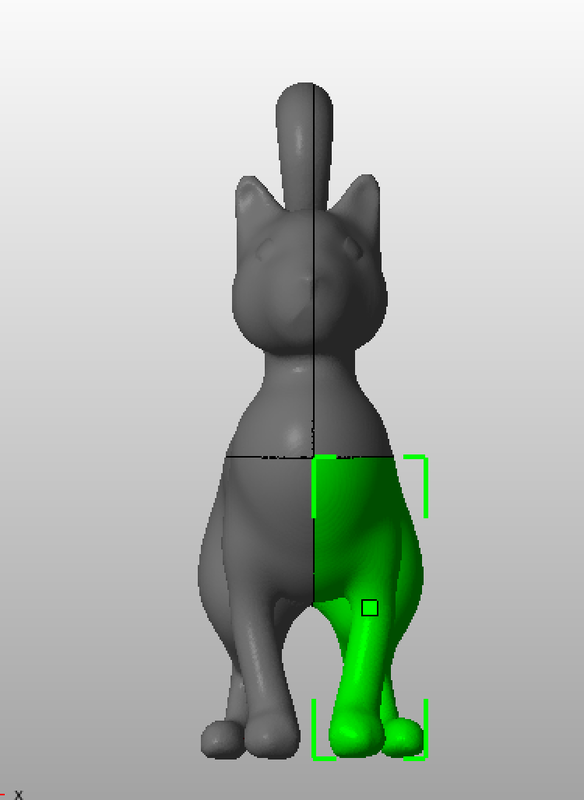 In the Cura software, there are three basic ways to view the model. Each is useful for different reasons, especially when a problem arises with your prints. Solid: Cura’s default view enables you to get a good idea of how the model will look when printed. It will show you the size and shape related to the print platform. Generally, if all looks OK and you’ve used the shortcuts just to navigate around the model, then hopefully all will turn out just fine. X-Ray: This feature is great for when prints go wrong and quickly enables you to see parts of the internal structure of your print. Where it really comes in handy is if your print is suffering from manifold edges — edges that intersect other edges. Cura’s X-Ray enables you to see what needs to be reworked. Layers: If a print is failing every time at a certain point, or you’ve done something clever and just want to check that part of the print is OK, you can switch to Layers. An accurate way to do this is with the arrow keys. Alternatively, there’s a slider for quickly looking through all of the layers that build up your print. As you get more advanced with Cura, this feature is handy for pinpointing layers where you want to change settings in the G-code, such as increase fan speed, layer height or flow. Sometimes, you may want to move the model along Cura’s build area because you don’t want to print the model right at the center of the printer platform. At other times, the imported model might have the wrong orientation on the build area. If your model needs adjusting, all you need to do is click on the model so that it is highlighted and then select one of the options from the tools on the left. Here you can quickly move, rotate and scale the model. When you click on any of the Tool options in Cura, you’ll see the arrows appear around the model. Just grab an arrow or hoop to make the change in the direction that you want. If you go wrong then you can just right-click and select Reset. You might want to print more than one model. With the model selected, right click and select duplicate. Cura 3D will automatically reposition the models. If there’s enough space to print two or more, then all models on the platform will be yellow. If there isn’t enough space, then the model out of the print area will be shaded gray. Perhaps the most important part of the Cura window is the settings panel on the right. You need to choose the correct settings in this panel in order to get your desired print quality. Cura’s settings panel is divided into two sections. 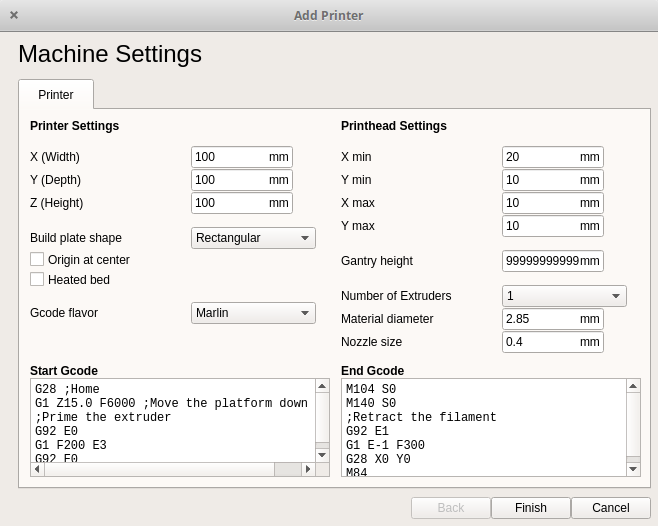 The topmost section is the Printer Settings and the next section is called Print Setup. This section lets you select the right printer and material. Printer: This is the printer that you selected in the first step. If you have more than one printer, then these can be set up, and then selected from this dropdown menu. Material: Quickly select the material that your printer is using. This option is used for printers that are tethered to the machine and will not appear if your machine doesn’t have this feature. Recommended: The Recommended print options are calculated on the settings you input when initially configuring the Cura slicer for your printer. This option is a great choice when you’re just starting out or you just want to see how the software and printer communicate. Options are limited under the Recommended header, but you can quickly adjust quality, infill, plate adhesion, and basic support structures. Custom: This is where the fun really starts and will enable you to adjust the print settings – from quality through to speed. We’ll look at this section and the options a little later. As we have already discussed, 3D printers print an object by depositing layer after layer of material. The Layer Height slider in Cura controls that height of each individual layers. Here, the rule is: the lower the layer height, the better the print quality and vice versa. But note that setting a low value for Layer Height means that the print is going to take proportionally longer to complete. You need to make a trade-off between quality and print speed and pick your own sweet spot. 0.1 mm is a good starting point. The Infill slider controls the quality of the infill. Setting it to 0 % essentially means that you don’t want any infill and want your object to be hollow. Anything in the range of 10% – 40% is known as a light infill. The 50% – 90% range is called a medium infill. Setting the slider to 100% will produce the strongest model. Light is a good starting point. When the Infill slider is set to above 0%, a checkbox titled Enable Gradual appears. Checking this box will make Cura gradually increase the amount of infill towards the top of the model. This lets you use a low value for Infill and still get decent top quality. It’s recommended that you check this box when using low values for Infill. 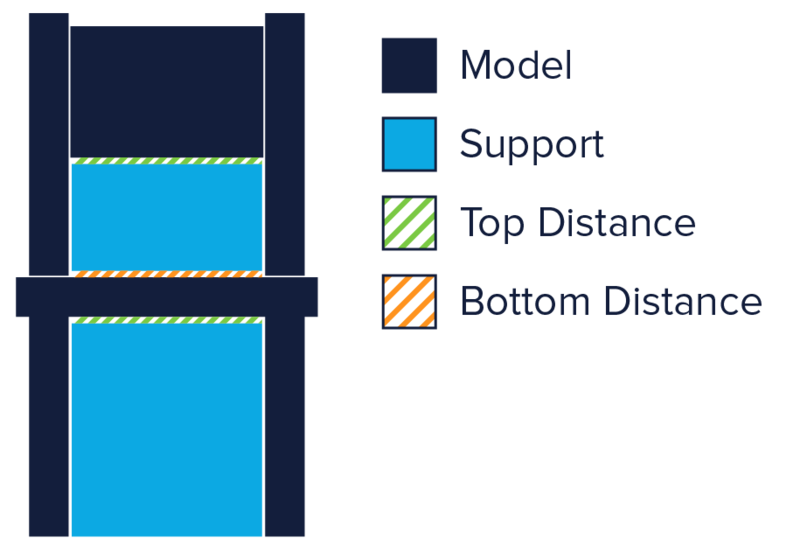 These are your support and adhesion settings – controlled by two checkboxes titled Generate Support and Build Plate Adhesion. If this is your first print, then switch both on. As a rule, if your 3D model has plenty of contact with the print platform then switch off Build Plate Adhesion. If your model has no overhangs switch off Generate Support in Cura’s Helper Settings. The model is now print ready and all you need to do is to export the file from Cura to either an SD card or send it directly to the printer. Cura will now handle everything converting the 3D STL or OBJ into the G-code file required by the printer. Save the 3D print file: Click either Save to file, Save to SD or Send to Printer button on the bottom right of the window. Estimate of time for 3D print: Cura will give you a rough estimate on the length of time it will take for your printer to print the piece. Start the 3D print: If tethered, sit back and wait for the printer to fire up and start printing. If you save to SD, then eject the SD card from your computer and transfer to your printer. Select print, select the file and go. Cura Tutorial What are Cura's Custom Settings and why Should you Bother? Using the recommended Cura settings is just the start. Cura’s standard settings will produce decent prints, but you might often run into some specific issues. For example, you might not like the surface finish of the print. In some cases, the surface might contain a spurious line of excess material, also known as a Z-Seam. Your printer nozzle might be leaking material during travel moves, leaving strands of filaments in places where there should be none. There are plenty of other problems that you might encounter when using the simple settings in Cura – print speed too slow, the object not durable enough, the bottom surface is warped etc. All of these problems can be solved with the help of the Custom settings panel in Cura. This is why you should be aware of the Custom settings panel in Cura and know how to change these settings to tackle specific problems and obtain the best possible print quality. Cura’s Custom settings can be accessed by clicking on the Custom tab on the Settings panel. This will expose the Custom settings, which is divided into 9 sections – Quality, Shell, Infill, Material, Speed, Cooling, Support, Build Plate Adhesion and Special Modes. Each section contains a few settings under them. Note, however, that the Cura settings that you see under each section are only a small fraction of the settings that you can actually change. Many settings are not visible by default. This is what you need to do to expose the Cura settings that are hidden: Click the gear icon next to a section header. A window will pop out. This window shows all the Custom settings. There are about 150 different settings here, but don’t worry, you will need to use only a handful of them to solve the most common problems. In order to make a hidden setting visible, simply check the checkbox corresponding to that setting, and then close the window. From now on, this setting will be visible anytime you access the Custom settings panel. 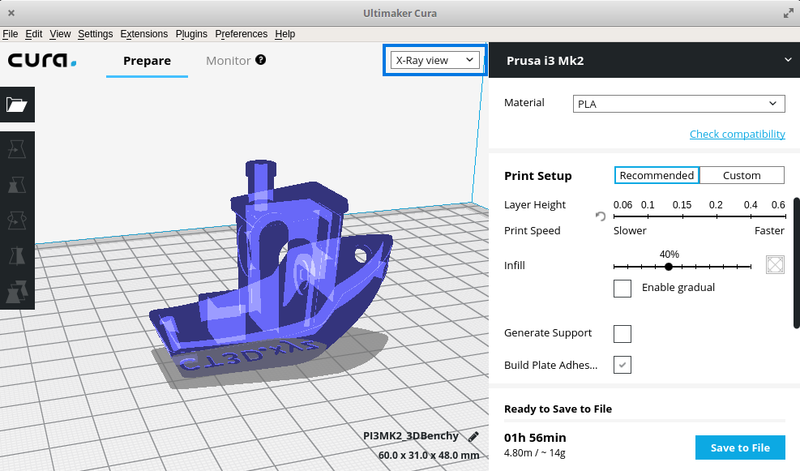 In the following sections, we will dive into Cura’s most important Custom settings and explain how you can use them to improve print quality and solve common 3D printing problems. This is where things get really interesting, so buckle up. This setting is actually a duplicate of the Layer Height slider in the Recommended settings, but we will go through it again – with some pictures this time! Identical models printed with varying layer height. Notice how thinner layers (right to left) lead to better quality. The Layer Height setting controls that height of each individual printed layer (in mm) in the Cura software. Here, the rule is: the smaller the layer height, the better the print quality and vice versa. But note that setting a small value for layer height means that the print is going to take proportionally longer to complete. You need to make a trade-off between quality and print speed and pick your own sweet spot. 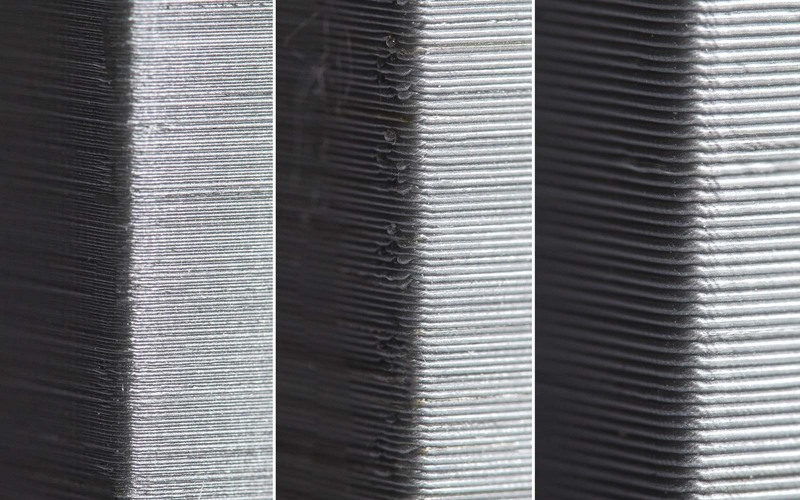 A closer look at the impact of layer height on surface finish. These settings under the heading Shell affect the outside of the print in the Cura slicer. The most important setting in this section is called Wall Thickness. The Wall Thickness adjusts the total thickness of the outer walls (but not the top or bottom walls). This value should be an integer multiple of the nozzle size of your printer. For example, if the nozzle size of your printer is 0.35mm and you choose the Wall Thickness to be 3 times that (1.05mm), then the printer will essentially print 3 walls (each wall being 0.35mm thick). In general, a Wall Thickness of 2 or 3 times the nozzle diameter is sufficient. A higher value will create a sturdier model and decrease the chance of leaks, while a lower value can significantly decrease the print time and filament costs. All plastics shrink as they cool. Some plastics, like PLA, shrink only a little bit, while others, like Nylon or ABS, shrink a lot. When you are working with precise sizes, shrinkage can be a big frustration as your model will typically end up being smaller than the measurement of the CAD model. The Horizontal Expansion setting will allow you to adjust the size of your 3D print in the X/Y dimension to compensate for the change in size that happens when the plastic shrinks as it cools. Horizontal Expansion is one of the Cura settings that are hidden by default. So you have to enable it first by following the procedure we outlined before. Once enabled, it will appear under the Shell settings. A positive Horizontal Expansion value will add to the dimensions of your model. 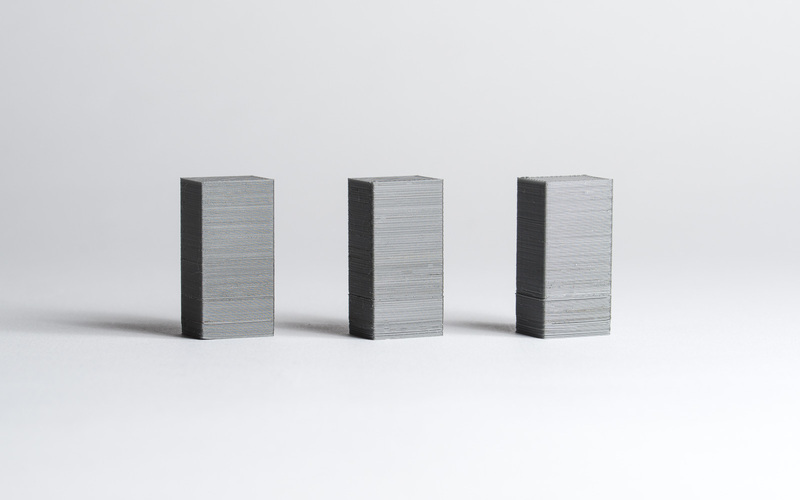 You should use a positive value when your printed model is smaller than you expected, as it is most common with shrinkage. A negative Horizontal Expansion value will reduce the dimensions of your model. Use a negative value when your printed model is larger than expected. Sometimes, the printer will leave a mark on the model surface at the start of each layer. When these marks all align, the 3D model will have a prominent spurious line on its outer wall. This line is called a Z-Seam. The Z-Seam Alignment setting lets you choose where in the 3D model surface this line appears or lets you get rid of the line altogether. The prominent line in the model wall is the Z Seam. You probably want to avoid this artifact. The Z-Seam Alignment setting is also hidden by default. First, enable it so that it appears under the Shell settings in the Cura software. There are four choices for the Z-Seam Alignment setting: Shortest, User Specified, Sharpest Corner and Random. Shortest is Cura’s default value. When selected, the Cura slicer software instructs the printer to start printing a new layer from the endpoint of the previous layer. This often leads to a visible seam, so this choice should usually be avoided. User Specified lets you specify where exactly on the model surface you want the Z-Seam to appear. When selected, two more settings become available – Z-Seam X and Z-Seam Y. These Cura settings correspond to the X-Y coordinates of the Z-Seam. Sharpest Corner instructs the printer to start printing each layer from the sharpest corner on the model surface. A corner, by virtue of being sharp, can cover up a Z-Seam in many cases. However if your model does not have sharp corners, then this option is not too useful. Setting Z Seam Alignment to Random will start each layer at a random position. This will eliminate the seam completely, but will also lengthen the print time as the print head will require additional time to move to a new position between each layer. Sometimes when you print thin walls with Cura 3D, the areas between the inside and the outside of the wall is left unfilled. This might happen when the width of your wall is between a multiple of Cura’s line width (printer nozzle diameter). Cura leaves the inside and outside walls unfilled to prevent putting too much plastic into that section of the object, but it also means that gaps can show up in the print. The Fill Gaps Between Walls setting lets you choose how Cura handles these gaps. Notice the gaps near the perimeter of the model? Those are the wall gaps we are talking about. The Fill Gaps Between Walls setting is also hidden by default. First, enable it so that it appears under the Shell settings. There are two choices for this setting: Everywhere and Nowhere. When Nowhere is selected, Cura will not fill any gaps. When you select Everywhere, Cura 3D will fill every gap in your print’s walls and will make your model’s outer shell as strong as possible. Earlier, we discussed how you can make a model stronger and more durable by adding more walls (i.e. increasing wall thickness to be a higher multiple of the nozzle diameter). However, the thicker the wall, the more time it takes to print it. Cura offers a compromise between wall thickness and print speed via the Alternate Extra Walls setting. When enabled, the Cura software will add one extra interior shell to every other layer. For example, if your print is set for two nozzle diameters, Alternate Extra Walls will add an extra nozzle diameter on every odd-numbered layer. To enable this setting, first make it visible so that it appears under the Shell settings. Then simply check the checkbox corresponding to this setting. If you are still not satisfied with the surface finish of the model, here’s one more thing you can do. There’s a hidden setting called Wall Speed under the Speed section (and not under the Shell section!). This setting controls the speed at which the printer head moves while printing the walls. There are two separate settings for inner wall speed and outer wall speed. The default outer wall speed is 30 mm/s. Setting the outer wall speed a little lower than the default (try reducing in steps of 10 mm/s) can improve the surface finish of the model. Of course, decreasing the outer wall speed means that you are signing up for longer print times as well – so keep this in mind. By default, the Cura slicer prints a grid-shaped infill, printing in one diagonal direction per layer. This provides reasonable strength without eating up too much material. It is also one of the fastest patterns in terms of print time. Cura‘s standard infill pattern should be fine for most common applications. In some special applications though, the default pattern might not be best. 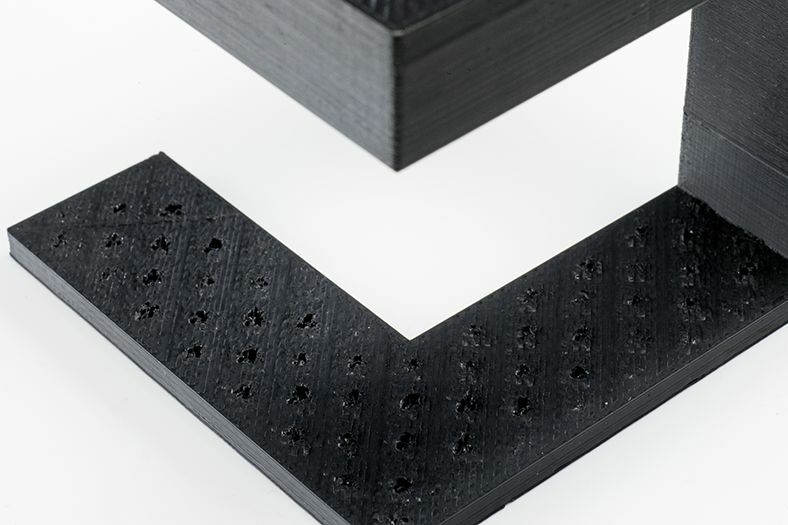 In such cases, Cura offers a range of infill patterns to choose from. Cura 3D infill patterns. There are more infill patterns available than shown in the picture. Grid: A grid-shaped infill, with lines in both diagonal directions on each layer. Lines: Creates a grid-shaped infill, printing in one diagonal direction per layer. Triangles: Creates a triangular shaped infill pattern. Cubic: A 3D infill of tilted cubes. Tetrahedral: A 3D infill of pyramid shapes. Concentric: The infill prints from the outside towards the center of the model. This way infill lines won’t be visible through the walls of the print. Concentric 3D: The infill prints from the outside towards the center of the model, with an incline over the entire print. Zig Zag: A grid-shaped infill, printing continuously in one diagonal direction. How to choose infill patterns? Is the part going to be used for mechanical purposes? Does the model have a large capping surface? If the part is not going to be used as a mechanical part, but rather for aesthetic purposes, then you might be able to get away by having no infill at all. However, if the same 3D model has a large capping surface, then the capping surface will require some support in order to be printed. In such cases, your best infill choice is Concentric. This uses minimal material and is the fastest to print. At the same time, it provides enough support for the top surface. If you want the model to have reasonable strength even if you are not going to use it for mechanical purposes, then the best option is to select a 2D pattern such as Grid, Lines or Triangles. Lines provides the least amount of strength but does not consume a lot of material and prints fast. Grid consumes more material, is slower but provides more strength. Triangles offer great strength and high lateral loads. Use this infill when you need good wall strength or longer, slender structures. If the model is going to be used for mechanical purposes, the best option is to go for a 3D infill pattern such as Cubic or Tetrahedral. With these patterns in Cura, you’ll get excellent internal support and near isotropic mechanical properties. 3D printing is not instantaneous like document printing. Printing something simple like a standard coffee mug can take several hours. The long print times can be very frustrating at times. 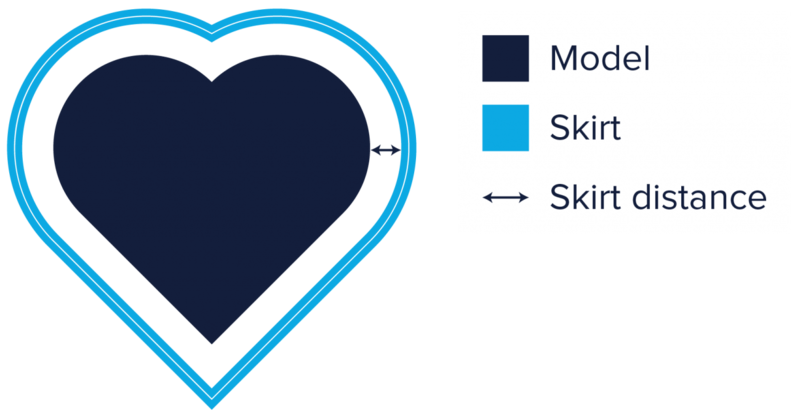 Therefore, the Cura slicer software offers a setting to control the overall print speed (simply called Print Speed) and several other separate settings to control the print speed of special structures like walls, infill, support etc. As a rule, the specialized settings in Cura software always override the overall speed (Print Speed) setting. We will talk about the specialized speed settings when we discuss the corresponding special structures (we have already discussed the Wall Speed setting). But in this section, we want to focus on the overall speed setting and its effects. Cura’s Print Speed setting can be found under the Speed section of the Custom settings. This setting refers to the speed at which the printer head moves during the print. The default value is 60 mm/s. To reduce print time, simply increase this speed. However, you should take note that increasing the print speed affects others things as well, and you should make necessary adjustments accordingly. When the printer head travels faster, the filament might not have sufficient time to melt as it comes out of the nozzle. This usually results in brittle models. You can usually solve this problem by increasing the extruder temperature so that the plastic can melt properly. Faster printer speed implies that the printer head is going to jerk and vibrate more vigorously. The model might show ripples in the surface as a result. Therefore, faster print speeds usually come at the cost of compromising quality. To find the optimum speed in Cura, it’s usually recommended that you experiment by going up in steps of 5 mm/s. This means, try 65 mm/s, check if you like the result. If you do, go up again to 70 mm/s. At some point, the print quality will become unacceptable. You can then choose a Print Speed in Cura 3D that is 5 mm/s below this point. If you find that you can’t increase speed without degrading the quality, another idea is to just increase the Infill Speed setting. This is a hidden setting, so you have to make it visible first. This setting controls the speed at which the Infill is printed, without affecting the print speed of other parts of the model. Since the infill is invisible, the quality of the infill doesn’t matter as much. But it reduces print time all the same. In some situations, you might actually need to decrease Print Speed. If you are printing highly detailed models, a lower print speed will help in reproducing details more accurately. There’s also some filaments like PET+ or Flex PLA which usually require lower print speed settings in the 3D slicer. To slow down the print speed, simply lower the value of Print Speed setting. 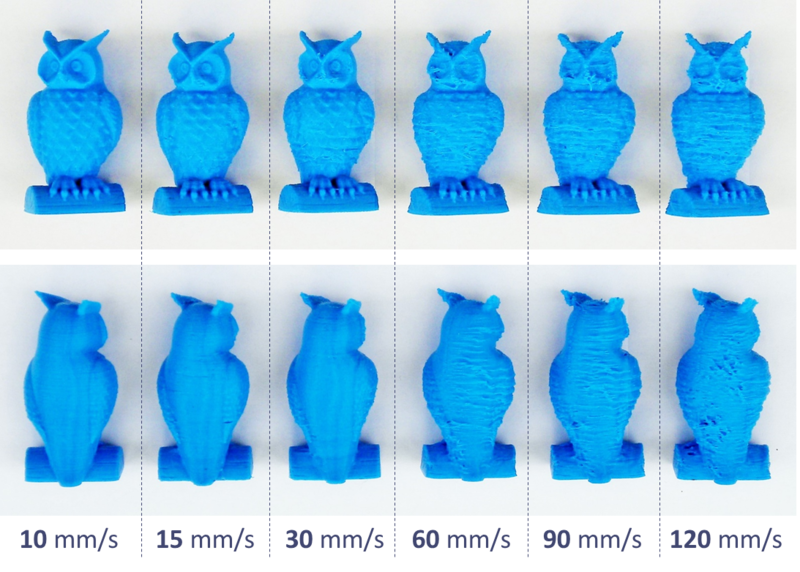 Filament manufacturers will often have a “suggested print speed” for their specialty filaments. For highly detailed models, start by lowering the print speed by 10mm/s, then adjust it up or down in increments of 5mm/s as needed. Extruded filament remains malleable until it cools. Therefore, many 3D printers use cooling fans to speed up this process and harden the material as it is being laid down. A good cooling system also prevents distorting the last layer as a new (and hot) layer is being laid down. Cura enables cooling by default, except for the first layer. The first layer is skipped as cooling it would reduce the print’s ability to adhere to the build platform. All other layers are printed with cooling turned on. However, when you have cooling turned on, the nozzle might fail to reach the temperature required to melt the plastic. This is a case of excessive cooling. When it happens, your printer will simply stop and display an error message saying that the nozzle couldn’t reach the required temperature. Cura 3D offers a way to solve the excessive cooling problem via the Fan Speed setting. This is a hidden setting under the Cooling section. As usual, you should make it visible in your 3D slicer first so that it appears under the Cooling section. The value of this setting is set as the percentage of the fan’s maximum speed. If you need to adjust the setting in Cura, start by modifying the value to 80%. Be aware that for values below 20%, the fans may not receive enough power to spin at all. For very small prints, a layer might print so fast that the fans do not have enough time to cool it before the next layer starts printing. When this happens, the unfortunate small layer warps due to the heat of the next layer. The result is a mess. The Minimum Layer Time setting in the Cura slicer can help solve this problem. This is a hidden setting under the Cooling section. Using it, you can give the fan more time to cool down these very small layers. The value of this setting is the minimum time for a layer to print. For very small layers, Cura will slow down the print speed so that the layer takes at least the minimum time to finish printing. The default value for this setting is 5 seconds. If you are running into distorted small layers, start by increasing it to 10 seconds, then continue to make adjustments in 5-second increments as needed. Some materials like Nylon, Polycarbonate, and PET+ needs to be printed in still air. These materials shrink a lot when cooled. If cooling is enabled while printing with these materials, the model will warp and distort in unexpected ways. You need to turn off cooling in Cura when printing with these materials. Simply look for the Enable Print Cooling setting under the Cooling section and uncheck the checkbox. Cura will turn off cooling when you do that. When plastics are printed, they firstly expand slightly but contract as they cool down. If material contracts too much, this causes the print to detach from the build plate and bend upwards. 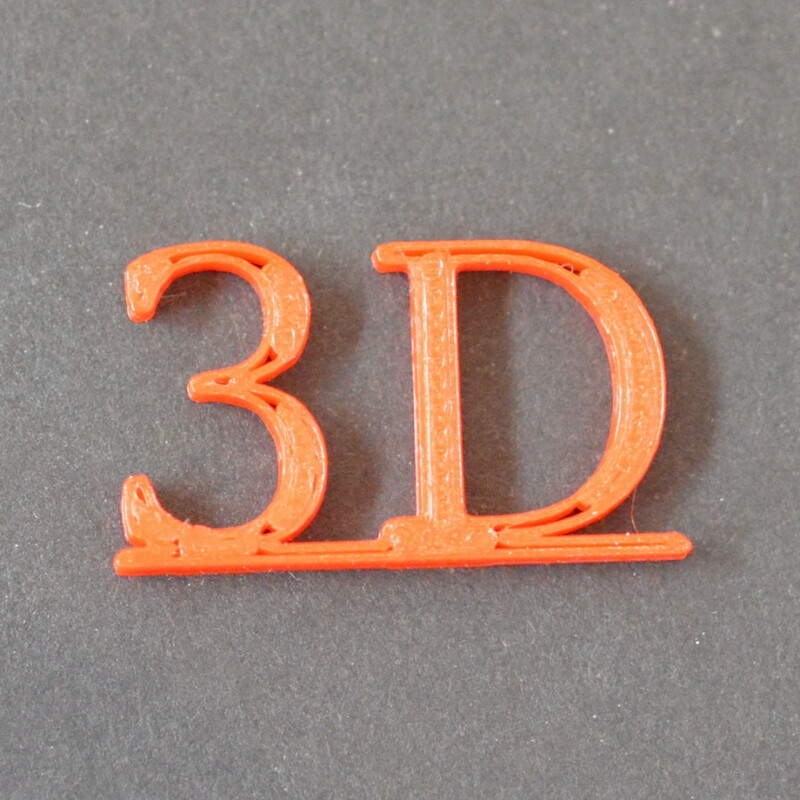 This phenomenon is called warping in 3D printing slang. Some materials shrink more than others (e.g. ABS, PET+, PC or Nylon have a higher shrinkage than PLA), which means there’s a larger chance of warping when using them. 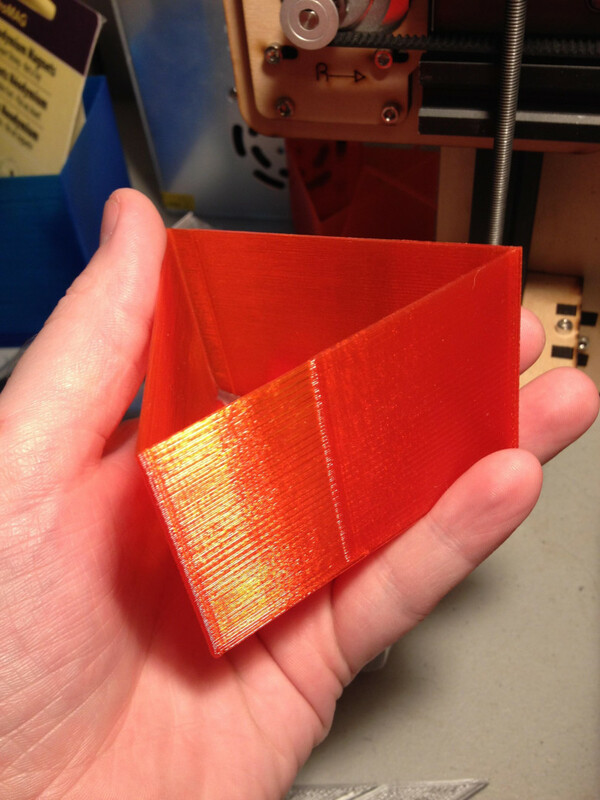 Warping causes the lower layers to lift up and warp. Cura offers some settings that help prevent warping. The most important of these is the Build Plate Adhesion Type setting, found under the Build Plate Adhesion section. There are three options for this setting – Skirt, Brim, and Raft. Skirt is the default option in Cura. It is a line around the print on the first layer that just helps to prime the extruder. If you get significant warping, you should consider changing to the other options Brim or Raft. When you choose Brim, Cura places a single-layer-thick, flat area around your object, which resists the pulling forces as the print cools. As the brim is only a single layer thick, it’s easy to remove once the print is finished. For some materials or models, a brim might not be enough to prevent warping. In these instances, using Raft in the Cura settings is advisable. A raft adds a thick grid between the model and the build plate, ensuring that the heat is distributed equally. It is particularly useful when the bottom of a model is not completely flat, or when printing with industrial materials. The Build Plate Adhesion section is not the only one that can help prevent warping. Here are some other Cura settings that can help. A thicker first layer often makes adhesion easier. You can make the first layer thicker by changing the Initial Layer Height setting. This is a hidden setting under the Quality section in the Cura slicer. Make sure you change the value to a number higher than what you chose as Layer Height. It is important not to set the initial layer speed too high, as the material may attach to the nozzle and get dragged around with it, instead of remaining fixed to the build plate. To slow down the speed for the first layer, first, make the setting called Initial Layer Speed under the Speed section visible. Then set the speed lower than the default value. There’s another setting called Number of Slower Layers in Cura which can help with better build plate adhesion. This setting will slow down the printing of the bottom layers and defines the number of layers it will take the printer to reach the set print speed. The speed, based on the initial layer speed and print speed, will linearly incline over the number of layers specified in the Number of Slow Layers setting. A higher value will decrease the chance of your print warping, but this setting can also increase your print time significantly. As we discussed before, the print head fans are usually turned off (fan speed = 0) for the first print layer, to ensure optimum build plate adhesion. Cura offers another setting called Regular Fan Speed At Height, which turns on the fan gradually, from no fan for the first layer to maximum power at the specific height. In this sense, this setting is equivalent to Number of Slower Layers, but for cooling. It’s a hidden setting, so you will have to make it visible. Try a value slightly higher than the default and it should improve plate adhesion. Take note that warping can happen for many reasons such as wrong calibration, tilted build plate or insufficiently heated build plate. Some of these issues cannot be addressed within the scope of the Cura slicer, so you should ensure that you have fixed these issues before you try messing with the Cura settings. Sometimes, the top surface of the print is not completely closed and shows bumps. This is called pillowing in 3D printing slang. This problem often stems from incorrect Shell, Cooling or Quality settings. Here’s how you can solve it by tweaking the Cura slicer settings. Pillowing can be best addressed by changing the Top/Bottom Thickness hidden setting under the Shell section. Like any other hidden setting in Cura 3D, you need to enable it before it appears under the Shell section. To create a smooth top surface, it’s important to use a thick enough top. When the top is too thin, you get a surface with holes in it. To fix this, simply increase the Top Thickness. The recommended thickness is six times the layer height. So if your layer height is 0.1mm, then the Top Thickness should be 0.6mm or more. But the Top Thickness is not the only factor when it comes to pillowing. Sometimes, too little cooling might also be at the root of this issue. If the plastic does not cool properly, it may hang down a bit or curl up at the places where it crosses the infill lines. This means that an uneven surface is created for the next layer that must be placed on top of it, leading to bumps on the top surface. Therefore, if increasing the Top Thickness does not solve the problem, try increasing the Fan Speed under the Cooling section. It seems that especially thinner layers have the tendency to curl up. Therefore it could help to increase the layer height. Stringing is yet another common problem. Sometimes, you will find strands of plastic in your print where there shouldn’t be any. This typically happens when the extruder leaks plastic as it moves from one point to another during a non-extruding phase. To get rid of stringing in Cura or any 3D slicer, the most obvious course of action is to enable retraction. Retraction essentially means that the filament is pulled back a little bit by the feeder when the print head performs long travel moves. This effectively stops the leaking of filaments. To enable retraction, look for the Enable Retraction checkbox under the Material section. Make sure the box is checked (it should be checked by default). 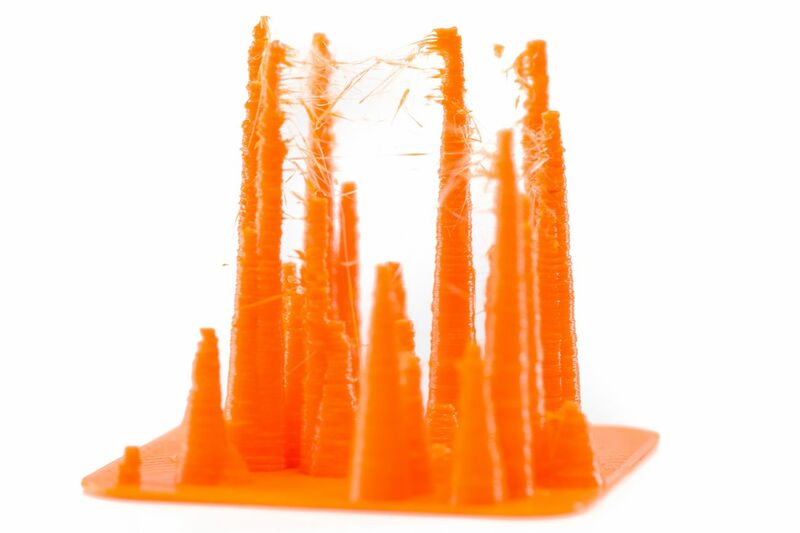 However, enabling this setting is often not enough to stop stringing completely and you might have to tweak the print temperature and speed to completely get rid of this problem. Print temperature plays a big role when it comes to leaking filament. If the temperature is very high, the filament will be more liquid and prone to dripping through the nozzle. 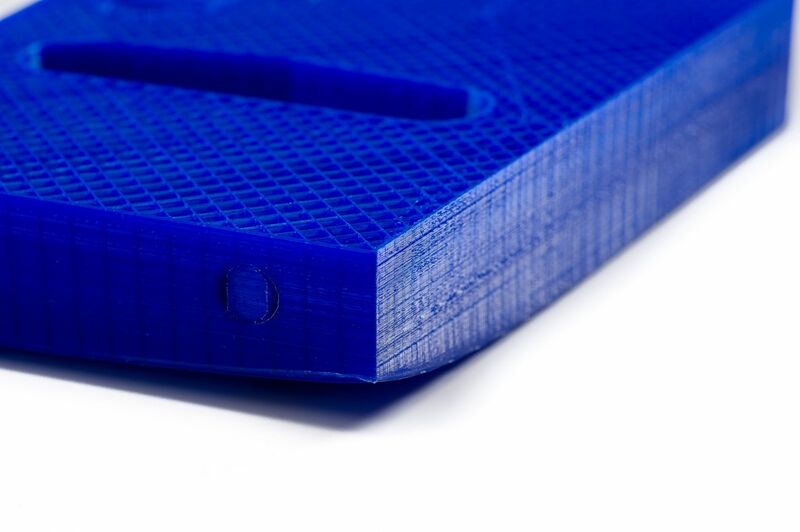 Therefore, reducing the print temperature goes a long way in reducing stringing. You can find the Printing Temperature setting under the Material section. It’s hard to say which temperature to use exactly. It depends a lot on the filament. Try reducing the temperature in steps of 10 degrees in the Cura software until you get the best results. Keep in mind that when you reduce the temperature, there is a chance that your material will start under-extruding. Earlier, we discussed the connection between temperature and print speed and how they need to be adjusted together for the best results. So when you lower the temperature, make sure you reduce the print speed accordingly. It might also help to increase the travel speed under the Speed section. This way the print head will travel a bit faster so that the material has less time to drip from the nozzle while traveling. Travel speed of 200 mm/s should be fine for most prints. Many 3D models have overhangs. These 3D models require additional support structures to print successfully. Cura can generate these support structures automatically in most cases. When the print job completes, the support structures can be removed by breaking them off manually from the model. Is the support structure correctly placed and strong enough to provide the required stability during the print job? Is the support structure easy to remove afterward? Does the support structure deteriorate the surface finish of the overhanging parts? Cura 3D offers a host of support structure related settings under the Support section of the Custom Settings. Using these settings, it is possible to create support structures that provide the necessary stability, are not too hard to remove and that do not affect the surface finish of the model. Let’s dive in and see how to make adjustments. How do you figure out if your model needs additional support? Cura 3D makes this easy. Once you have imported your model into the Cura 3D slicer and positioned it on the virtual build plate, look out for sections colored in red. Those are the parts where Cura has detected instability. Note that it is possible that you will not see unsupported areas until you rotate the camera view. If you see red on the bottom of the part, where the model touches the build plate, you don’t have to worry about this area being unsupported. The build plate will take care of this problem. Small red areas at the top of holes or between two structures are called bridges, and Cura will handle them automatically too. If there are other parts highlighted in red, then you need to start worrying. To begin with, you need to enable the auto-generated support structures to ensure that those red parts can be printed successfully. To do this, simply check the Generate Support checkbox under the Support section in Cura 3D. So you have now enabled the auto-generated support structure, but probably didn’t see anything change in the model view. That’s because Cura does not show the support structures in the default Solid view. To see the support structures that were generated, change the view to Layer View. Support material (lines and volume) will be displayed in teal. Move the layer slider up and down to see where Cure 3D added the support structures the 3D model. When you enable support structure, a setting called Placement automatically appears under the Support section. The Placement setting lets you coarsely control the positioning of the support structure. There are two options: Everywhere and Touching Buildplate. Everywhere is selected by default. When Everywhere is selected, Cura 3D attempts to build structures wherever they are necessary. 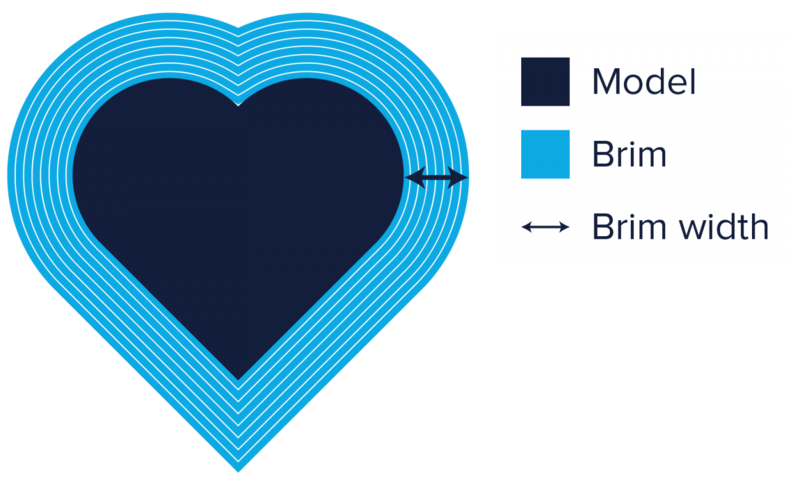 This means you not only have support structures that are erected on the build plate, but also support structures that use part of the model as its base. This is the reasonable option in most cases as this ensures that all unstable areas will have the necessary support. However, if Everywhere is selected for very complicated models, the model might end up being completely encased by support material. If you don’t want this, simply change the Placement setting to Touching Buildplate. This will create support structures underneath overhanging sections of the model only between the build plate and the model. Since a model’s overhang is always printed on top of support structures, you don’t always get the best surface finish for these parts. The Enable Support Roof hidden setting can help with that. A support roof is a dense skin at the top of the support structure which does not compromise the surface finish of the overhangs too much. When you enable this setting in Cura 3D using the checkbox, you will get a better finish quality. But this improvement comes at a cost as this option makes the support structures harder to remove than usual. Use this option only if the surface finish of the overhanging part is critical to the function of the finished part. Sometimes, the support structures are built too close to the model’s outer wall and leave marks on the model’s outer surface. You can prevent this from happening by using the Support X/Y Distance hidden setting under the Support section. 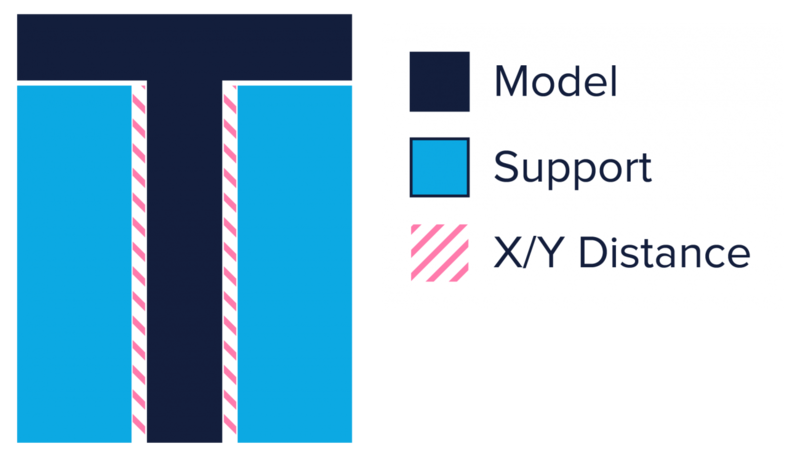 The Support X/Y Distance setting in Cura essentially controls the minimum allowed distance between the model’s vertical walls and a support structure in the X-Y plane. If your support structure is damaging the walls or sticking to them, you can increase the value by increments of 0.2mm until the walls come out smooth. However, please ensure that there are no small overhangs sticking out of the outer walls that will go unsupported if you put a little bit of distance between the support and the walls. If such small overhangs exist, you might even have to decrease the X/Y distance instead of increasing it. Otherwise, you will get a failed print. In order for the support material to break away cleanly without pulling the model layers apart, the connection between the support material needs to be made weaker then the connection between the layers of the model. Cura creates this weaker connection by leaving a space between the top and bottom of the support structure and the model – and this space is known as Z-Distance. You can make the support structures easier to detach by controlling the Z-Distance hidden settings under the Support section. The default value for this setting is the same as layer height. So if your layer height is 0.1mm, the default Z Distance will be 0.1mm too. If your support material is difficult to break away from your model, increase this value in increments of your layer height until it comes away cleanly. Cura can either add support on any given layer or not add support. Unfortunately, there are no “half layers of support.” So if a 0.2mm Z Distance setting for a print with a layer height of 0.1mm is too much, and the Z Distance of 0.1mm is not enough, you’re out of Z Distance options. Cura generates support material in one of seven patterns. You can change the pattern by using a hidden setting called Support Pattern under the Setting section. In most cases the default pattern, Zig Zag, will generate the best balance between strength and ease of removal. The other pattern options are Triangles, Lines, Grid, Concentric, Concentric 3D and Cross. If you are unhappy with the default pattern, you can experiment with the other options. Each of them will give you a different balance between strength and ease of removal. The Spiralize Outer Contour special mode is a hidden setting under the Special Modes section in Cura’s settings. When you enable it using the corresponding checkbox, Cura will print a hollow model instead of a solid model. The extruder will trace a continuous path that spirals upwards along the walls of the model, printing a solid base and a one nozzle width thick wall. It will not print any infills or support. This mode is very different from standard layering in 3D printing since the extruder moves in the Z direction at all times, instead of stepping up only when a layer has been completely printed. Since the extruder moves continuously and prints only the walls, this reduces the print time to a fraction of normal. It also enables you to save a lot of materials (no infills). On the downside, models made using the Spiralize Outer Contour mode usually are not durable due to the lack of infill. Spiralize Outer Contour doesn’t work if your model has overhangs exceeding 45 degrees. Flat areas parallel to the build platform cannot be printed in this mode. When this mode is selected, Cura will still respect the layer height, print speed, and other basic settings in Cura. This means that you will need to select the Layer Height and Line Width. Set Wall Thickness to the same value as your Line Width, change Wall Line Count to 1, set Top Layers to 0 and set the Infill to 0%. If you want to print non-manifold designs or orphaned geometry, Cura offers a special mode for that! It’s called Surface Mode and it is available as a hidden setting under the Special Modes section. When you make the setting visible, you will have three options: Normal, Surface and Both. When you select Normal, Cura tries to print the object normally. When you select Surface, Cura only prints the X-Y walls and makes them one nozzle width thick. This lets you print walls that are not connected to any solid volume. When you select Both, Cura prints solid parts of the model normally, and prints only the walls for non-manifold areas or orphaned parts. We have so far discussed many different settings in the Cura 3D slicing software that each solve a specific problem. Of course, experimenting with all these settings to figure out the sweet spot can be very time consuming and expensive. In the ideal case, you should be changing only one setting at a time to figure out its effect on the print quality. But then, you might get completely different effects when you combine the settings because they often interfere with one another in unexpected ways. The process of figuring out the right setting is, for this reason, more art than science – and there is actually no right or ideal prescription for it. But there is at least a way to speed up experiments. 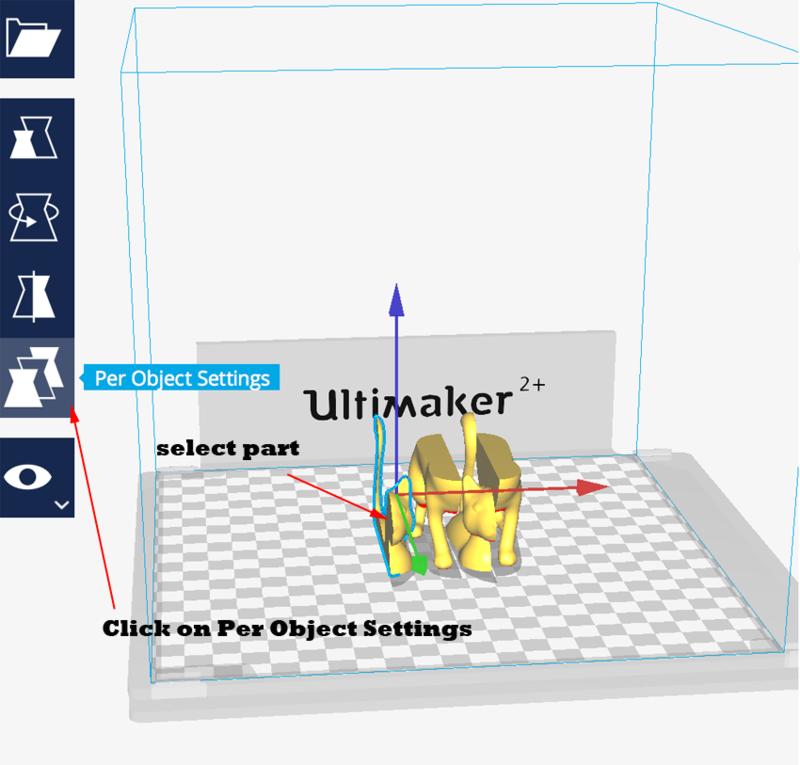 Cura offers a feature called Per Object Setting which allows you to run multiple experiments during just a single print cycle. It lets you apply different settings to different parts on the print platform. So you can divide your model into multiple parts and then print each part with a slightly different setting. Once the print completes, you can choose the part that you like the best in terms of quality, note the settings and then run another round of experiments starting from that setting. You first need to divide your model into multiple parts. Besides Cura 3D, you’ll need additional software. First, find a model which is large enough to divide into multiple parts. Download and install Netfabb. Since Autodesk bought Netfabb, they decided it should be a commercial product. However, you can download the old – free – Netfabb 7.4 Basic on GitHub (We have run it on Windows 10, both on a 64-bit and 32-bit machine and both seem to work fine. You can just chuck the contents of the zip file somewhere and open netfabb.exe without installing. You can even find the Version 7.4 Manual here.). Netfabb is a software which helps you fix problematic models. But it can also help you cut the model into multiple parts. Open your model in Netfabb and use the cutting tool to divide the model into sections. Select each section (Ctrl + left click) and export them separately. Make sure you use a naming convention that helps you put the parts back together to make the whole model again. Open all the parts in Cura 3D. Select each part (Ctrl + left click), and then click on the Per Object Setting button on the floating bar on the left. This will allow you to apply the current setting to only that part. Once you have chosen different settings for each part, select all the parts (Ctrl + left click on all the parts individually). From the top menu, select Edit > Merge Object. Cura will try to merge the parts together to form a coherent model. Export the G Code and print. Each part will be printed with the settings that you assigned them. After the print completes, you can now inspect the parts and try to choose the setting that you like the best. When you do experiments this way, you can run as many as four trials in a single print cycle, thus saving time and material. We call it the “smart experimentation cycle”. So that’s it for this looong Cura 3D tutorial. We hope you enjoyed it. If you have followed everything and can successfully apply the right Custom settings to the right problems, the print quality you are getting out of your printer should improve by leaps and bounds. 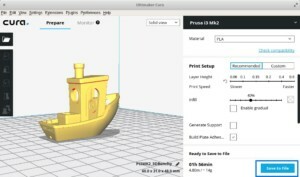 If you indeed experiment a lot with Cura 3D after reading this article, we would love to hear about your experience – fails, successes and everything in the middle. While we have tried to cover the most important settings in this tutorial, we left many not-so-commonly used settings out. 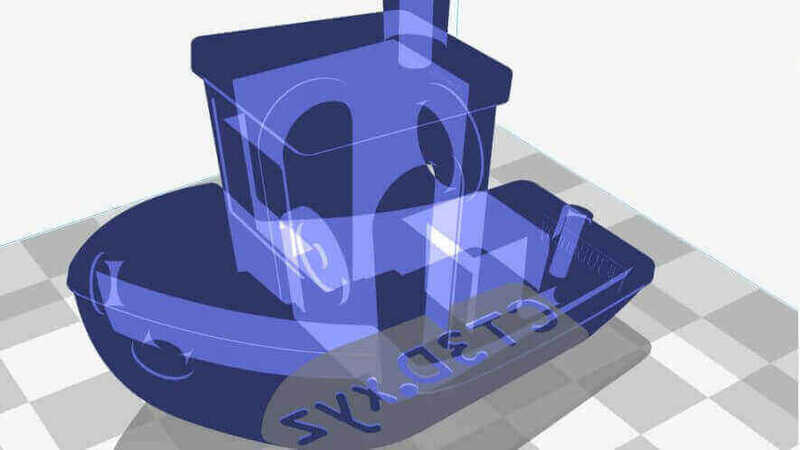 Cura 3D has more than 100 hidden Custom settings – we use only about 40 in our day to day printing. We hope that once you start experimenting with the commonly used Cura settings, you will dare to go beyond and try out the other hidden settings. This entire process of optimizing settings to squeeze every bit of quality out of the printer is challenging, fun and addictive! License: The text of "2019 Cura Tutorial – Deep Inside the Cura 3D Slicer Software" by All3DP is licensed under a Creative Commons Attribution 4.0 International License.